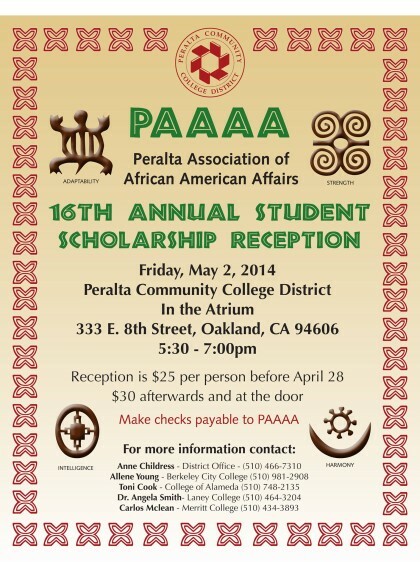 The Peralta Association of African American Affairs (PAAAA) scholarship recognizes eight (8) African American students attending Berkeley City College, College of Alameda, Laney College and Merritt College, who demonstrate academic achievement, leadership skills, and community service in the various communities where they live, work and study. Since 1998, PAAAA has distributed over $60,000 in scholarships to PCCD students to assist them in continuing their education. PAAAA will host its 16th annual student scholarship reception on Friday, May 2, 2014 in the atrium of the District Office at 5:30pm. Congratulations to the PAAAA 2014 Scholarship Recipents!